The Christ Church Choir is directed by Jeffrey Hoffman. Choir provides a wonderful opportunity for musical training, fun, fellowship, and for our ultimate purpose, divine worship. Our affiliation with the Royal School of Church Music sets an international benchmark for excellence in our choral program and provides individual choristers and the parish music staff with resources for achieving that goal. 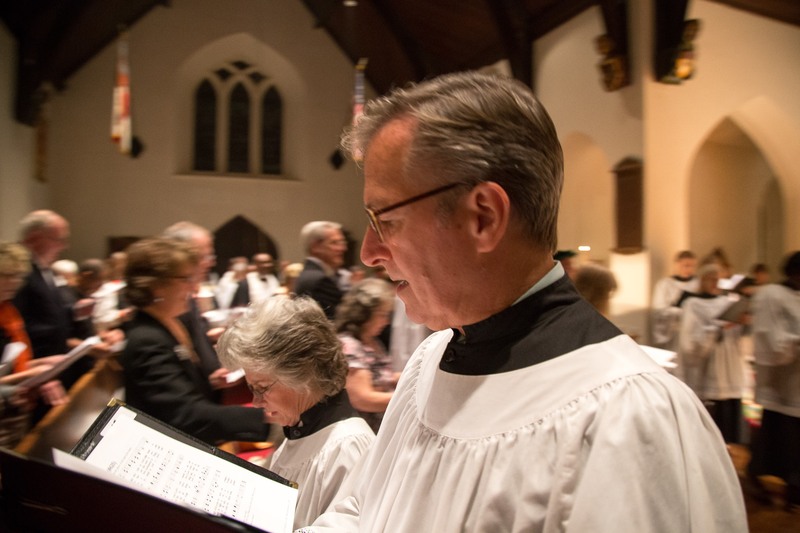 Our choral program emphasizes music from the great Western tradition of choral music for the church with occasional forays into repertoire from around the world. 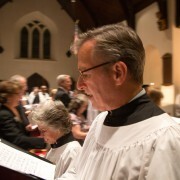 Our Parish Choir program runs from September through June. The Parish Choir is open to all parishioners in high school and older. Anchored by our accomplished team of four professional choristers, our Parish Choir leads the congregation in singing the hymns and canticles of the church service and also sings anthems and motets from the great Anglican Church music tradition at key moments in the liturgy to enrich our worship. The Choir rehearses at 9 am each Sunday before the 10 am service and again after the service and coffee hour to prepare for the coming weeks (approximately 11:30 am – 1:00 pm). We also sing on major holy days and on other special occasions, including for concerts and also occasional invitations away from the parish. Our professional choristers provide musical leadership within each section, soprano, alto, tenor, and bass, so all our volunteer choristers can feel musically secure and supported each week. If you would like to add your voice to the choir this year, please fill in the choir registration form and bring with you to church on Sunday morning, or email to the choirmaster at jeffrey@christchurchpelham.org. In the summer months we offer the opportunity for a more relaxed approach to choral singing. Choristers may join for a single week at a time, rehearsing and singing simpler musical pieces before the Sunday worship service. Learn more about of vibrant Children’s Choir program.